A multi-vitamin and mineral smoothie mix! Gluten free, Paleo, Vegan. Nutritional support for growing children and peace of mind for parents to support healthy growth and development. Kids Good Stuff is a great way to help your kids get the nutrients they need to be happy and healthy form the inside out. NuZest Kids Good Stuff in Mint Choc flavour has been specially developed for children between the ages of 4 and 13, and provides all the essential nutrients they need for healthy growth and development. This great-tasting supplement has been carefully formulated by an independent team of nutritional experts, and is the perfect balance of greens, fruits, vegetables, herbs, vitamins and minerals. NuZest Kids Good Stuff supports normal physical and mental development; provides digestive support; supports healthy teeth and bones; contains nutrients chosen specifically to assist with learning, concentration, behaviour and overall brain development; helps to support a strong immune system; and provides balanced, sustained energy for learning and playing. As well as delivering vitamins and minerals, Kids Good stuff provides your child with so many additional beneficial ingredients that you won’t find in a capsule or gummy, including greens, fruit, veggies and berries, protein, digestive enzymes, prebiotics and probiotics – all delivered in a delicious smoothie. A delicious smoothie they’ll love! How to enjoy: Just add two scoops to 250ml of water or your favourite milk and shake-shake-shake! Best consumed in the morning. Origin: Made in New Zealand. 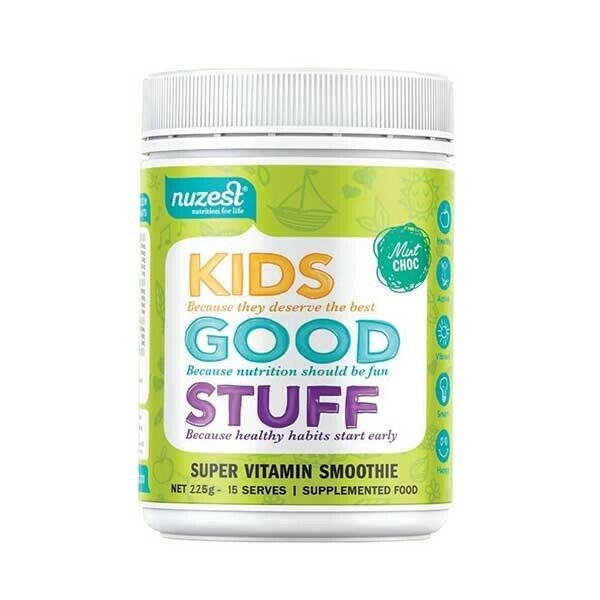 NuZest's Kids Good Stuff - Mint Choc Powder (225g) - a delicious multivitamin and mineral smoothie mix! 1. I am currently using a whey protein concentrate. Why would I switch to Clean Lean Protein? Clean Lean Protein ™ has a number of advantages over whey:- It is highly alkaline.This helps the body to avoid problems of excess acidity (such as the potential for increased muscle and bone tissue loss in order to 'buffer' the blood. )- Clean Lean Protein™ is higher in BCAAs and glutamine than WPC. 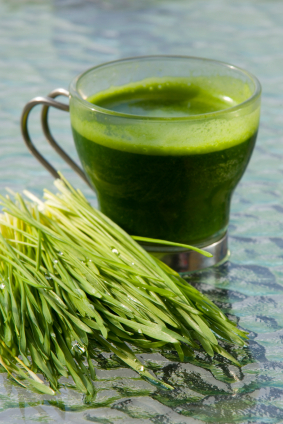 - It is a truly vegetarian protein source. Most whey protein is not because it's a by product of cheese making, in which they use rennet - an animal product - to separate the whey from the curds that provide the base for cheese. - It is more sustainable. Getting quality protein from vegetable sources is less input and resource intensive than dairy farming...so it's better for the planet too! 2. Is Clean Lean Protein better than whole eggs as a protein source? Whole eggs are a great source of protein. Neither Clean Lean Protein™ or eggs could be considered "better", however Clean Lean Protein™ protein offers some specific benefits: 1 Whole egg contains around 6g of protein. The protein is highly bioavailable and has a PDCAAS (protein digestibility amino acid score) of approximately 0.9+. Our Clean Lean Protein™ has a PDCAAS of around 0.98 (slightly higher than whole eggs) but offer the advantage of being highly alkaline and are isolated proteins, meaning that they can be used to simply and effectively bolster protein without other factors (such as fat content) having to be taken into consideration. Clean Lean Protein™ is also more convenient and less messy in smoothies and shakes, making it a great option for those easy meals "on the go". 3. I have recently started taking Clean Lean Protein. I am really enjoying it but have noticed that it contains glutamic acid. Is this the same as MSG? Glutamic acid (and glutamine) are amino acids that have nothing functionally in common with MSG (monosodium glutamate). The glutamate portion of MSG is the same amino form, but the functional characteristics of MSG are because of it's combined nature. Glutamic acid does not have the same properties or effects. Cliff Harvey - Naturopath, Nutritionist, Mind-body Therapist and Strength Coach. "I have two young boys so breakfast time is always crazy. I've been having the clean lean protein for breakfast for five weeks now (and sometimes for dinner when I'm feeling lazy), not only am I fuller for longer and have more energy but have lost 5 kilos! I have tried most of the protein powders in the market and this doesn't make me feel bloated or clogged. I would recommend it to anyone who wants to feel fuller for longer, healthier and lose weight along the way!" "Just wanted to let you know how impressed I was with the pre-packaged sachets of Good Green Stuff and Clean Lean Protein. I took a box of each product away with me to the national archery tournament, held recently in the Coromandel. As a competitive archer, I am away from home up to 10 times per year, and maintaining good nutrition on the road can be a real challenge. The sachets provided me with a quick and easy pre and post competition snack, and peace of mind in knowing they contain all natural ingredients. Plus there's the added convenience of not having to measure out portions, which makes them well worth the investment. Ten out of ten! :)"